From the 1820s to the 1870s, one of the most significant land routes in the United States was the Santa Fe Trail. It was located along the edge of what would become Tampa. Two Santa Fe Trail markers were located on the trail near Tampa. 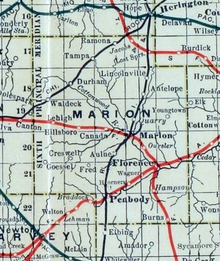 The trail was active across Marion County from 1821 to 1866. In 1854, the Kansas Territory was organized, then in 1861 Kansas became the 34th U.S. state. 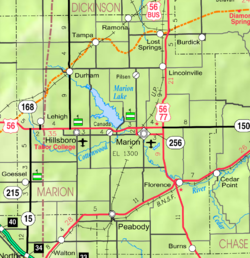 In 1855, Marion County was established within the Kansas Territory, which included the land for modern day Tampa. In 1887, the Chicago, Kansas and Nebraska Railway built a main line from Herington through Tampa to Pratt. In 1888, this line was extended to Liberal. Later, it was extended to Tucumcari, New Mexico and El Paso, Texas. It foreclosed in 1891 and taken over by Chicago, Rock Island and Pacific Railway, which shut down in 1980 and reorganized as Oklahoma, Kansas and Texas Railroad, merged in 1988 with Missouri Pacific Railroad, and finally merged in 1997 with Union Pacific Railroad. Most locals still refer to this railroad as the "Rock Island". The Golden Belt Town Company filed the plat for Tampa in 1887. The source of the city name is said to have been suggested by a railroad engineer who rode one of the first trains through Tampa. Tampa was incorporated as a city in 1908. A post office was established in Tampa on April 17, 1888. Tampa is located at 38°32′55″N 97°9′18″W﻿ / ﻿38.54861°N 97.15500°W﻿ / 38.54861; -97.15500 (38.548493, −97.154893). According to the United States Census Bureau, the city has a total area of 0.18 square miles (0.47 km2), all of it land. Tampa has one building listed on the National Register of Historic Places (NRHP). 1910 P.H. Meehan House (NRHP), 401 North Columbus Street. Not open to public. Santa Fe Trail Markers, numerous markers in the area. Santa Fe Trail Self-Guided Auto Tour. As of the census of 2010, there were 112 people, 48 households, and 27 families residing in the city. The population density was 622.2 inhabitants per square mile (240.2/km2). There were 67 housing units at an average density of 372.2 per square mile (143.7/km2). The racial makeup of the city was 98.2% White and 1.8% Native American. Hispanic or Latino of any race were 0.9% of the population. There were 48 households of which 22.9% had children under the age of 18 living with them, 50.0% were married couples living together, 6.3% had a female householder with no husband present, and 43.8% were non-families. 43.8% of all households were made up of individuals and 23% had someone living alone who was 65 years of age or older. The average household size was 2.33 and the average family size was 3.19. The median age in the city was 45 years. 28.6% of residents were under the age of 18; 5.4% were between the ages of 18 and 24; 16.1% were from 25 to 44; 23.2% were from 45 to 64; and 26.8% were 65 years of age or older. The gender makeup of the city was 58.9% male and 41.1% female. As of the census of 2000, there were 144 people, 59 households, and 37 families residing in the city. The population density was 736.5 people per square mile (278.0/km²). There were 69 housing units at an average density of 352.9 per square mile (133.2/km²). The racial makeup of the city was 93.06% White, and 6.94% from two or more races. Hispanic or Latino of any race were 9.03% of the population. There were 59 households out of which 30.5% had children under the age of 18 living with them, 50.8% were married couples living together, 11.9% had a female householder with no husband present, and 35.6% were non-families. 33.9% of all households were made up of individuals and 25.4% had someone living alone who was 65 years of age or older. The average household size was 2.44 and the average family size was 3.21. In the city, the population was spread out with 30.6% under the age of 18, 6.9% from 18 to 24, 21.5% from 25 to 44, 16.7% from 45 to 64, and 24.3% who were 65 years of age or older. The median age was 36 years. For every 100 females, there were 105.7 males. For every 100 females age 18 and over, there were 88.7 males. As of 2000 the median income for a household in the city was $18,125, and the median income for a family was $42,083. Males had a median income of $25,000 versus $23,125 for females. The per capita income for the city was $12,677. There were 6.9% of families and 15.6% of the population living below the poverty line, including 25.7% of under eighteens and 11.1% of those over 64. Tampa is home to Tampa State Bank and Tampa Cafe. The Tampa government consists of a mayor and five council members. The council meets the 1st Monday of each month at 7PM (winter) or 8PM (summer). City Hall, 113 W 3rd. Fire Department, 302 N Main St.
Tampa is part of Unified School District 397. The high school is a member of T.E.E.N., a shared video teaching network between five area high schools. All students attend schools in Lost Springs area. Centre High School, located south of Lost Springs. Centre Junior High School, located south of Lost Springs. Centre Middle School, located south of Lost Springs. Centre Grade School, located in Lost Springs. Tampa High School was closed through school unification. The Tampa High School mascot was Tampa Tigers. Hillsboro Free Press, free newspaper for greater Marion County area. The Herington Times, newspaper from Herington. The Salina Journal, regional newspaper from Salina. The K-15 highway is 3.75 mi W of the city. Tampa is served by the Union Pacific Railroad, formerly the Southern Pacific, and formerly the Chicago, Rock Island and Pacific Railroad. Tampa is located on UP's Golden State main line to El Paso, Texas and still serves the Tampa Elevator during summer harvests. Fiber Optics is provided by TCT. Satellite is provided by HughesNet, StarBand, WildBlue. Satellite is provided by DirecTV, Dish Network. Terrestrial is provided by regional digital TV stations. Rural is provided by Flint Hills RECA. Rural is provided by Marion County RWD #1. A History of Tampa, Kansas, and Its Environs, 1887–1987; Tampa Centennial Committee; 1986. ^ a b c d e f Geographic Names Information System (GNIS) details for Tampa, Kansas; United States Geological Survey (USGS); October 13, 1978. ^ a b "Tampa – Directory of Kansas Public Officials". lkm.org. Retrieved 4 September 2015. ^ "HughesNet Gen4 Internet – Unlimited Satellite Internet – Skyways". skyways.org. Retrieved 4 September 2015. ^ Santa Fe Trail Research Site Larry and Carolyn Mix. "Santa Fe Trail DAR Marker Location in Kansas 1997 Survey". santafetrailresearch.com. Retrieved 4 September 2015. ^ "Official Santa Fe Trail Association". santafetrail.org. Retrieved 4 September 2015. ^ "Rock Island's Family Tree – Page 4". covad.net. Retrieved 4 September 2015. ^ Marion County Kansas, Past and Present; Sondra Van Meter; 1972. ^ Blackmar, Frank Wilson (1912). Kansas: A Cyclopedia of State History, Volume 2. Standard Publishing Company. p. 796. ^ "Kansas Post Offices, 1828–1961 (archived)". Kansas Historical Society. Archived from the original on October 9, 2013. Retrieved 14 June 2014. ^ Santa Fe Trail Research Site Larry and Carolyn Mix. "Tampa Kansas in Marion County Kansas". santafetrailresearch.com. Retrieved 4 September 2015. ^ "Centre". usd397.com. Retrieved 4 September 2015. INterlocal #632. Retrieved 4 September 2015. ^ "Hope Pulls Out Victory Over Tampa", The Manhattan Mercury, 12 January 1964, p.3. Wikimedia Commons has media related to Tampa, Kansas. This page was last edited on 23 March 2019, at 15:13 (UTC).